How your shower is designed can make the difference between merely getting clean and having a fully restorative experience. If you are considering replacing your shower, turn to Beaverton Plumbing near Portland, OR, for quality results from our licensed plumbing experts. The decision to replace or install a new shower in a renovation, restoration, or new construction gives you the freedom to choose just the right features to suit your needs and tastes. The right fixture will allow you to control water temperature and flow with safety features to ensure no nasty surprises of an icy cold or boiling hot spray. 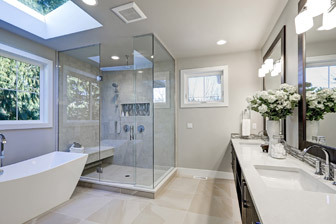 The professionals at Beaverton Plumbing will determine if the shower fixtures and accessories you choose will be able to operate on your current plumbing configuration or if they will function better if we relocate the plumbing to ensure optimum performance and satisfaction. Let Beaverton Plumbing take care of “plumbing the rough” that involves correct installation of valves and fixtures that need to be plumbed into your water line. You will rest easy knowing that the job is done right, and that what is under the surface is as perfectly functional as your finished shower is beautiful.